Heating, ventilation and air conditioning. It’s sort of the progression as your latitude decreases from big numbers to small numbers. For heating we have an Espar (aka Eberspächer) Hydronic 10 diesel fired coolant heater that does double duty. It’s fundamentally a “flash” hot water heater. A circulation pump moves coolant through the unit and then through a set of coils in our hot water tank for domestic hot water. In the tropics Fay likes to have the water warmed up “just a little bit”, to about 100˚F (37˚C) which takes about 15-20 minutes. The heater draws diesel fuel directly from the day tank, but consumes only about 0.1gph (.4lph). 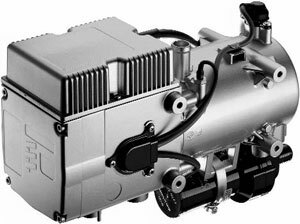 When we need to heat the entire boat, an auxiliary circulation pump moves the water through five heat exchangers in three thermostatically controlled zones. The thermostat for each zone controls the fan on the heat exchanger to push hot air into the boat. When we don’t need space heating, a bypass valve shuts down the circulation through the boat and limits it to the hot water tank. In the tropics we normally rely on good circulation of outside air to keep the boat cool and fresh. We have three 24” square hatches, four 10” square hatches, six dorades, and 10 portholes to provide lots of air movement. When the hatches and portholes need help we also have five Caframo Bora fans to push the air. On a few occasions, usually in a marina where there is no air movement at all, or when we close the hatches because there is too much loud music ashore, we need air conditioning. In the forward cabin we have a Marine Air Vector Turbo VDK6K for 6,000 BTUs of air conditioning. This runs off the inverter and easily cools down the forward cabin for comfortable sleeping. We don’t use it very often, but when we need it, we really appreciate it.